HR has certainly come a long way in being perceived as a strategic function with significant impact on business outcome. Yet, despite workforce and technology investments, multiple challenges – including the growing talent deficit, problems with skilling and retaining niche talent, and the increasing flexibility and better experience demands of Millennials and Generation Z – are inhibiting HR departments from attaining their full strategic potential on behalf of the enterprises they serve. The solution is moving to a next-generation HR model with digital transformation at the core. The inefficiencies of the traditional model – siloed HR systems, a large number of touchpoints, and a disjointed employee experience – are clearly exposed by the challenges cited above. The next-generation HR model addresses these issues with a cloud-based platform at the center, augmented by technologies such as advanced analytics and automation. This results in an intuitive and integrated model that has the ability to provide an enhanced employee experience. To successfully adopt the next-generation HR model, enterprises should take a structured approach that considers several important factors. While the importance of operational cost reduction and process standardization can’t be disparaged, enterprises should prioritize the employee experience when they plan for a digital HR transformation. Be it HR service delivery or technology modernization, the end goal should be to provide an integrated, intuitive, and seamless employee experience to better attract, engage, and retain talent. Empowerment: HR should offer employees integrated, accessible, and disintermediated workflows and systems that empower them to serve themselves. Methods include employee self-service tools, omnichannel experiences, chatbots, and analytical tools, all of which enable employees to have more control over the decisions they make. Engagement: Millennials and subsequent generations exhibit different behavioral patterns, are digital natives, and expect seamless employee experiences. Enterprises should adopt solutions that enable HR to engage and retain this ever-evolving talent. Solutions that are integrated, user-friendly, and provide consistent experiences across sub-processes / third-party portals with optimized response times and accuracy should be the key focus areas. Rather than implementing a handful of technologies haphazardly, enterprises must take an orchestrated approach to digital HR transformation that enables the technologies to feed off each other, find synergies, and maximize the impact. The findings in our recently published report made it clear that while each individual technology lever (see chart below) is powerful, enterprises can realize the maximum transformative impact when all the levers are applied in cohesion. Why is this? Although the impact of technologies such as Robotics Process Automation (RPA) and BPaaS are focused on enhancing the efficiency of various processes, predictive and prescriptive analytics are capable of deriving net new insights. On the other hand, cognitive/AI technologies such as Natural Language Processing (NLP) and Machine Learning (ML) can be bundled with other digital levers to significantly improve the stakeholders’ experience, in addition to increasing efficiency and providing net new gains. With technology changing so rapidly, organizations need to make sure that they fully embrace digital transformation, and buckle up to face and be ready for the changes. Many organizations are already working in this direction. To learn more about this topic, our recent report titled “The Key Ingredients for a Digital-First HR Transformation” identifies and deep dives into five key levers (automation, analytics, cloud, advisory, and employee experience) that will help enterprises successfully transform their HR function. The US Labor Department’s recently announced new regulations for H-1B and L1 work visas focus on the Trump Administration’s ongoing effort to tighten regulations and increase administrative hurdles. Viewed individually no new regulation is a show-stopper; but it’s clear that, collectively, they will have a more material effect. 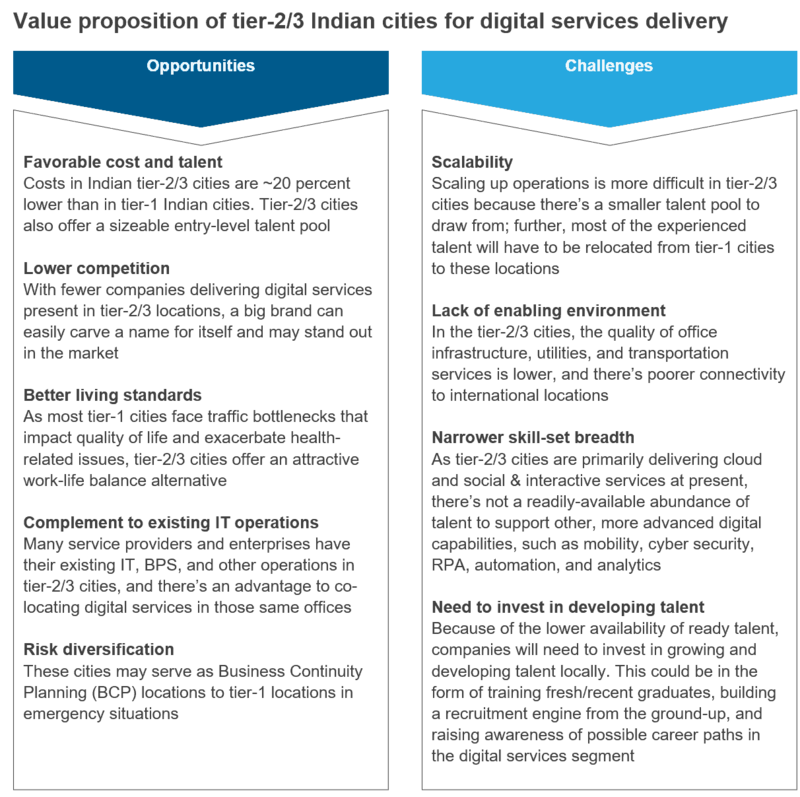 Here’s my take on the significant issues for service providers and their customers. The jury trial in a lawsuit against TCS, filed by US workers alleging discrimination against US-born workers, opened this week. The suit claims TCS shows a preference for hiring Indian workers through H-1B visas when hiring locally in the US, even when trained US citizens were available. I believe this lawsuit is hugely important for the entire service provider industry, not just TCS, but not because of a possible settlement or the amount of damages. In fact, I believe whether TCS wins or loses the lawsuit is almost irrelevant. There’s a bigger implication: the services firms are in a no-win situation that they must now address. Let’s look at why this case is so significant. First, let me point out that TCS is not the only service provider firm to be sued for discrimination. In US companies, diversity is not only desired, but it is increasingly unacceptable to have a non-diverse workplace. Therefore, it’s perfectly understandable that the service provider firms, which have historically organizations which heavily utilize Indian talent, are easy targets for lawsuits claiming discrimination. Litigants may not need to show specific examples of discrimination – only the results from a pattern of hiring or promotion. It really doesn’t even matter whether the lack of diversity was intentional or not. It’s just a fact of today’s US workplace that non-diverse hiring practices (for employees, middle managers and leadership) are now problematic. And the scrutiny that the service provider firms face is growing because of the difficult political environment. It costs less than having to hire in the US. The natural advantages combined with the economic advantages of importing Indian labor and hiring H-1B workers, resulted in a demographic dominated by Indian labor – but not necessarily a result of discrimination. However, this is a difficult argument to make when the statistics clearly show a skewed labor force. Clearly, the service firms are at risk and, in all likelihood, will need to address these issues. The demands both ethnic and gender diversity in workplaces. Given the US political environment that now exists, the third-party service industry will likely face increasing demands to change the status quo. They face a difficult set of choices, since they don’t want to discriminate against their current work force, yet they may need to take significant action to address the appearance of favoritism as well as change parts of their corporate culture, employment policies and benefits structure to bring them more in line with US expectations. If the service firms don’t address these issues, they run an increasing risk that a growing number of companies won’t do business with them. But it will be difficult and expensive to address the issues. It likely will cause rising costs in the US. The cost to remedy the demographic makeup of the work force is quite high and likely will adversely affect competitiveness and margins. Addressing the issues is also likely to create additional morale and legal issues. They can’t fire people to bring about a more diverse workplace. They must take the interests of existing employees in mind while they move to diversity. Moreover, addressing these changes will take time. And then there’s the reputation factor. At this time of great sensitivity to discrimination and jobs moving offshore, service provider firms face the prospect of increasing pressure to address these issues. But while doing so, they are still open to lawsuits, and these lawsuits would be expensive to litigate or settle. They can afford the litigation and possible judgments and settlements, however high the costs are. But they can’t afford damage to their reputations, brand and public image. A chatbot programmed to be a seven-year-old boy has become the first artificial Intelligence (AI) bot to be granted official residence in Tokyo, Japan. A NZ-based entrepreneur developed the “world’s first AI politician,” who is expected to run as a candidate in 2020. The CEO of Deutsche Bank estimates robots could replace half the bank’s 97,000 employees. U.S. Defense Secretary Jim Mattis implored President Trump to create a national strategy for AI. The University of Central Florida’s Center for Research in Computer Vision developed an AI-based system to detect often-missed cancer tumors. The above references highlight a mere fraction of the recent cognitive and AI-based developments. With every passing day, next-generation technologies are integrating seamlessly into our everyday lives. Enterprises, service providers, and technology enthusiasts across industries and business domains are closely looking at these revolutionary and rapidly evolving technologies, which currently seem to have only the sky as the limit to the number of use cases they can generate and empower. Indeed, countries the world over are welcoming this change, with the UAE recently becoming the first to appoint a minister for AI. Why do businesses need to embrace this change? The answer is simple: technology is no longer a means for savings money – factors such as enhancing the stakeholder experience and mining hidden insights are becoming even more crucial for companies to sustain their operations and stay relevant in the ever-changing economic environment. The entire global services industry is undergoing a tremendous transition from labor arbitrage to a digital-first model. In the HR space, talent acquisition (TA), including both permanent and contingent workforce acquisition, is continuously developing as a space ripe for ever-evolving innovation. Startups, HR tech incubators, and investors continue working towards eliminating recruitment pain points and creating a seamless hiring experience for both candidates and recruiters alike. Where is the Journey towards Digitalization of TA Heading? A host of technology offerings – from basic automation tools to gamification solutions to higher-end point solutions and cognitive and AI systems – are emerging in the TA space. 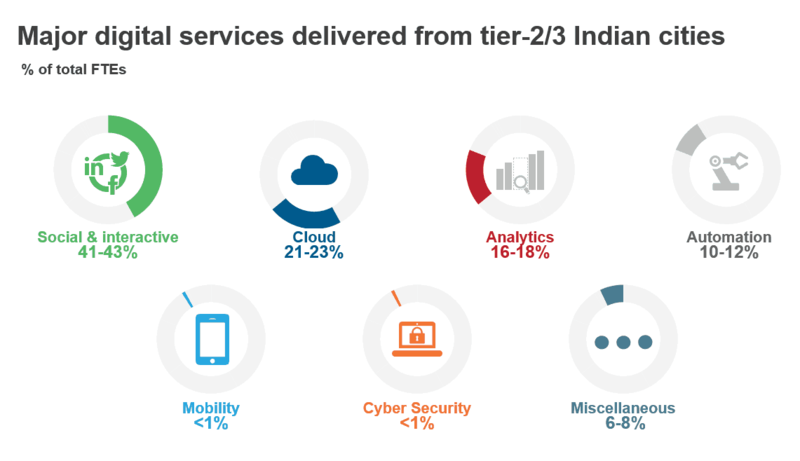 And per our recent research to understand where service providers and enterprises are in their journey toward unveiling the full potential of these technologies, the emerging landscape looks promising to kick-start a digital revolution that can transform TA in ways never imagined before. The following exhibit highlights four key new-age technologies that are finding significant traction in the TA space. The proper conjunction of all these technologies, just like the various organs of a human body, will give rise to effective and more efficient TA systems. Within TA systems, Analytics applications act like the left brain hemisphere, executing the more logical, analytical, and objective tasks that need to be accomplished. NLP applications act like the right brain hemisphere, executing the more intuitive, thoughtful, and subjective functions. RPA drives the implementation as the muscle, completing the loop to accomplish the objectives, and targets the left brain, the right brain, or both. 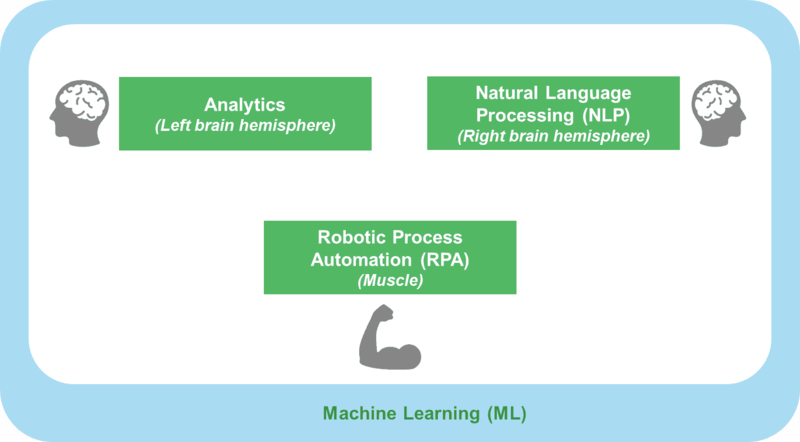 ML acts as the layer that sits behind all these technologies, and enhances the output further by giving machines the ability to remember and learn from patterns or behavior of the engaging stakeholders, gradually eliminating manual intervention completely. Here’s a simple example to demonstrate this process in TA: NLP applications learn about candidates – say from resumes, social media, etc. – to help analytics systems evaluate and predict best fit candidates from the information learned. RPA then reaches out to the shortlisted candidates. And all the while, ML technology carefully observes and documents everything to train the systems for better future use. What’s on the Immediate and Near Horizon? While some TA functions and tasks have already been automated, our research suggests that within the next five years, over 50 percent of them can be further digitalized leveraging next-generation technologies. The applications of these above technologies in TA are many-fold – AI-based sourcing and screening; psychometric, behavioral and gamified assessments; chatbot-driven candidate communication; and cultural fit, future performance, and attrition prediction – to name just a few. The ultimate aim is to simultaneously engage and win quality hires, leave a lasting candidate experience, and remove all manual, non-core functions from recruiters’ and hiring managers’ plates. The time is right for taking a holistic technology-driven revamp of TA functions to stay ahead of the curve in the quest for winning talent in a market that is agonizingly short of quality talent! Click here for a detailed view on the next-generation technologies shaping TA. And here for a deep-dive into the process and technology digitalization potentials in TA.